A "well" 83yrs lady attends surgery for her ‘annual review’. The nurse shows the ECG to the duty GP. Q1. What chronic condition is being monitored at her Annual review? Q2. What is she taking for this condition? Q3. What action should the GP take now? You note she had her annual bloods taken the week before, in readiness for her annual review with the CHD nurse. Her FBC, U&E's, Glucose, TFTs were all normal. As the nurse had already explained, you re-establish that she feels quite well. She's a relatively inactive 83yr old, who resides in the neighbouring residential home. The staff there haven't noticed any problems. She tells you her appetite is good, and she denies andy nausea, dizziness, chest pains or breathlessness on routine daily activity, albeit minimal. She's "perfectly happy, thank you very much doctor". Examination is unremarkable, other than an irregular pulse, consistent with the ECG. She's normotensive with normal heart sounds and no added sounds. Ignore the funny shaped ST segments for the time being. Start as always, by checking the background rhythm. Are there P waves present? Are the QRS complexes regular? As most of you worked out, the answer to both is ‘no”. 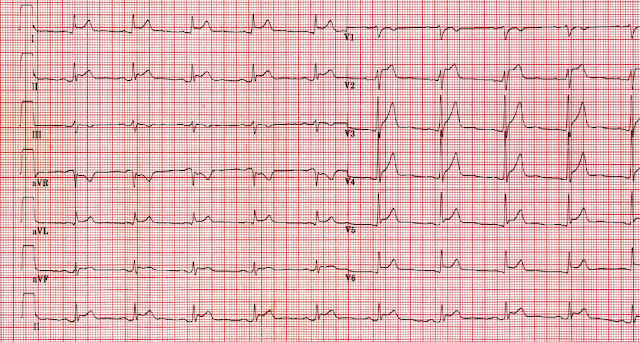 This ECG shows an underlying rhythm of AF with a good rate control (around 80 bpm ventricular response). The ‘quick’ way to measure rate on an irregular rhythm is by counting the number of complexes in 6 seconds (30 large squares) and multiplying by 10. 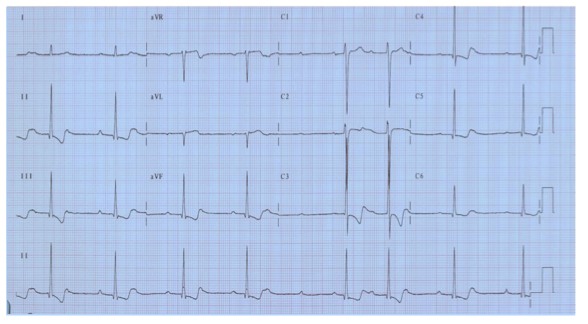 In this ECG, looking at the long lead II strip, there are 8 complexes in 30 large squares. So 8x10 = 80bpm. So, this lady was attending for her annual AF review. As AF is a precursor to many other cardiac conditions, an annual ECG helpful; but arguable. Annual pulse rate check is bear minimum. This lady is taking Digoxin. The ST-T complexes here are “scooping” – consistent with Digitalis ‘effect’. 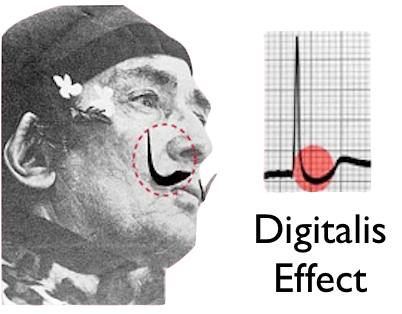 In the Digitalis effect, the ST segments are often likened to a ‘reverse tick” or to shape of Dali’s moustache! Never to be forgotten again. 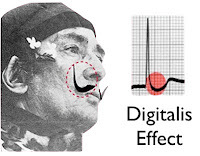 The important learning point here, is that the digitalis ‘effect’ does not necessarily mean toxicity...and ECG features can often be seen when digoxin levels are in the therapeutic range. This lady appears clinically well and denies any untoward symptoms. 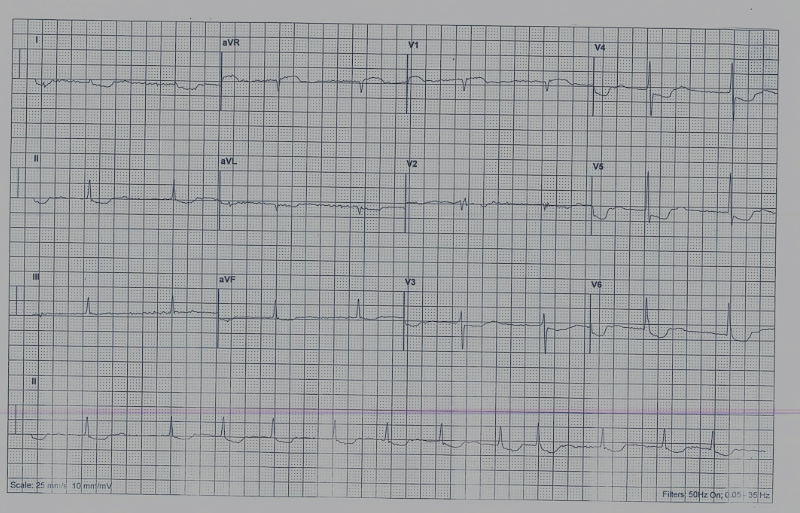 Given the changes seen on her ECG, we can probably assume that this is simply a digitalis ‘effect’ and no treatment or adjustment to her medication is necessary. It wouldn’t harm to check her Digoxin levels (and while you’re on K+ - just in case!) for reassurance, but this isn’t necessarily essential. Digoxin, derived from Digitalis lantana, was first described by William Withering in 1785. It is sometimes used to increase cardiac contractility (positive ionotrope) and as an antiarrhythmic agent to control heart rate, for example in fast AF. But superior rate-limiting agents, such as beta-blockers, have superseded it’s use as a first-line agent. It’s role remains important in AF associated with heart failure. Almost any dysrhythmia may occur except sinus tachycardia, SVT and rapid AF. 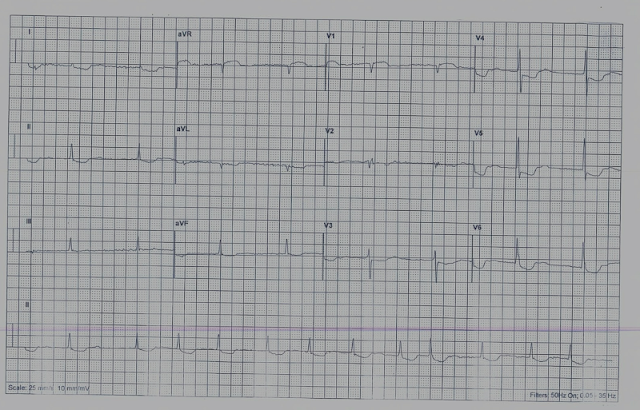 Note the irregular bradycardia, AV block and T-wave inversion. Hopefully, the history and examination would be clues here! A 40yrs old man comes in to see you in surgery. He's complaining of 2 days ‘sharp’ central chest pain, without radiation. His main complaint is breathlessness, and malaise, following his recent URTI which started 4 days earlier. On taking further history you discover his pain worse on inspiration, but also on chest wall pressure. At a glance, he looks a little unwell, and has slightly clammy skin. You note he's an infrequent attender, with no significant past medical history, so you guess he really doesn't feel very well. Any more questions you'd like to ask? He's a slim, muscular, non-smoker, on no medication. His father had an MI aged 68yrs. No other family history of IHD or vascular disease. He's never had any bloods taken, so his cholesterol is unknown. He's not previously reported/noted any exertional chest discomfort. He has had a slight irritant, dry cough since his URTI, but no sputum and haemoptysis, and no history of recent travel. On examination he's normotensive, and CVS examination is normal with normal heart sounds and no added sounds. He has a low grade pyrexia and mild tachycardia, in keeping with his reported URTI. His peripheral O2 sats are 99%. Indeed he has costal tenderness over the anterior chest wall. He admits he's worried about his heart. His history and clinical appearance doesn't seem suggestive of acute coronary syndrome requiring a 999 admission, so you agree with him to get an ECG, there and then. Can you see P waves? (if unclear in one leads, just check the others - they're either there or not). If present, quick check - is their morphology normal and consistent? Same for their relationship with the QRS? Yes. It appears to be regular doesn't it, and despite being slightly tachycardic when you examined him, his rate has settled down to around 60bpm. P waves can clearly be seen and their morphology looks pretty normal and consistent. There is a strange scooping seen after some of them - most notably in the inferior leads. 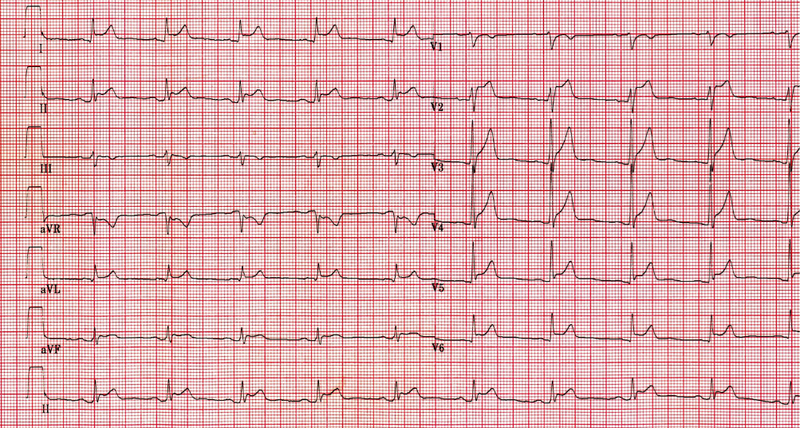 Take a look at lead II, III and aVF - see the slight depression of the baseline between the P and the QRS waves. In contrast - this same PR segment looks to be elevated in avR. The elevation seen might be described as scooped, or saddle-backed. So where are you at with your diagnosis? Are there any other tests you'd like to arrange in Primary care? Or do you think he needs admitting? Pericarditis is a cause of ST elevation which often throws us. As it is an inflammation of the pericardium it can lead to ST elevation in almost all leads. This is an important distinguishing feature from myocardial infarction, which has ST elevation localised to the region of infarct. MI also presents more acutely. If faced with uncertainty, in patients who are not unwell enough to warrant admission, and in whom the chest pain history does not suggest an acute coronary syndrome, then the most helpful test to support the ECG, is a serum CRP (CRP is rarely normal in pericarditis). Patients with pericarditis are often younger, with a lingering history of onset of symptoms, and frequently present to GP. (Some are inevitably admitted via the paramedic 999 service, having presented with chest pains and an abnormal ECG). Scooped or saddle-shaped ST segments, Often notched. Associated PR segment depression - that is depression between the end of the P wave and the start of the QRS. (usually elevated in aVR). Longer-lasting symptoms than acute MI. Pain can be eased sitting forward, and may be worse when laying back. Sometimes associated pericardial friction rub is noted on auscultation ("footsteps in the snow"). Never heard a rub? Listen here. ECHO may reveal small pericardial Effusion. For a summary on different patterns of ST elevation you might find this previous blog link useful. Once again, thanks to all who took part in tonights discussion, and for all your useful titbits and contributions. . As usual the whole conversation thread will be uploaded onto Storify.com in the next week.